If you have no teeth or if you suffer from deteriorated dental conditions like gum disease, malocclusion (bite imbalance), tooth decay, heavy wearing down or erosion of teeth, several failed root treatments, or several missing teeth, it is better to go for full set implant. An increasing number of people are opting for full set implants for one or more of these reasons. In full sent implants, titanium fixtures are used as anchors to support upper or lower full set replacements. In certain cases, both upper and lower full set replacements are also resorted to. If you wear a denture, or have deterioration, but want to avoid wearing a plate, we have many dental implant options to offer you. Our full set dental implants aim to provide a permanent solution to shaky dentures. At Tooth Implant Sydney, we are committed to offering you excellent care. We use advanced technologies to treat your dental problems. We have such advanced systems that we are able to offer you full set dental implants that look and work as beautifully and wonderfully as natural teeth. We offer you state of the art facilities, which come with everything that is required to achieve high standard services. Immediate results, greater functionality and better aesthetics are some of the advantages of choosing us for full set dental implants. We can offer you a complete smile makeover with full set dental implants in as little as time as s1 to 3 days. Most of you might be looking for a permanent solution for your dental problems. Hence, we suggest dental implants more than dentures. Dentures suffer from many drawbacks such as looseness, pain and discomfort from the denture rubbing on the gums or pressing on nerves, inability to bite or chew food well, limited ability to taste food and wine because of the plastic extensions that cover the taste buds, as well as poor facial aesthetics. Dental implants, on the other hand, are reliable, fixed, reduce or avoid the problems posed by dentures. In short, these implants have a positive effect on the quality of life. Remember the maxim – a stitch in time saves nine? In case of full set dental implants too, it holds true. Most of the dental problems could be solved if they were checked at the earliest time possible. It is always advisable to opt for full set replacement as early as possible. It should not be ideally postponed until such a time you lose every tooth. The longer the treatment is delayed, the higher the risk of bone loss due to disease or infection. Certain teeth can be used as markers to plan the aesthetics and as guides for the placement of the teeth implants during surgery. You can call us at 1300 850 072 and find out what are our services about. If you are looking to book an appointment, click here. 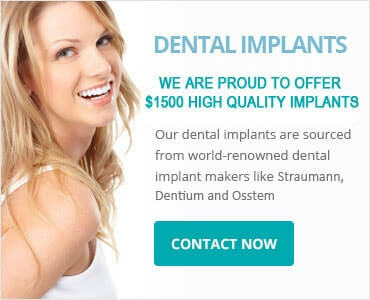 Tooth Implant Sydney will help you solve all your toothaches and restore that dazzling smile of yours. The choice is yours!